SUNNY BRAE – Amy Hubbard, a 7th and 8th grade math teacher at Sunny Brae Middle School, has been named Humboldt County Teacher of the Year. Hubbard was honored by the Humboldt County Board of Education during its meeting on Wednesday, Sept. 12 at the Humboldt County Office of Education in Eureka. Hubbard has been a teacher at Sunny Brae for the last nine years. She teaches Pre-algebra, Algebra 1, Algebra 2, and Geometry, as well as elective classes including Math Counts, Math Support and Introduction to Spanish. Hubbard belongs to a number of professional organizations and is involved in staff development and leadership activities, mentorships and training other teachers. She is involved in numerous extra-curricular student-based activities including Math-teacher Host on KEET TV “Homework Hotline,” Redwood Empire Math Tournament Coach, Girls’ Basketball Coach, Co-ed Soccer Coach, Dance Coordinator and Athletic Director. Hubbard received her Bachelor’s Degree from Humboldt State University, where she obtained her Single Subject Teaching Credential in Mathematics with CLAD (Crosscultural, Language and Academic Development) emphasis. 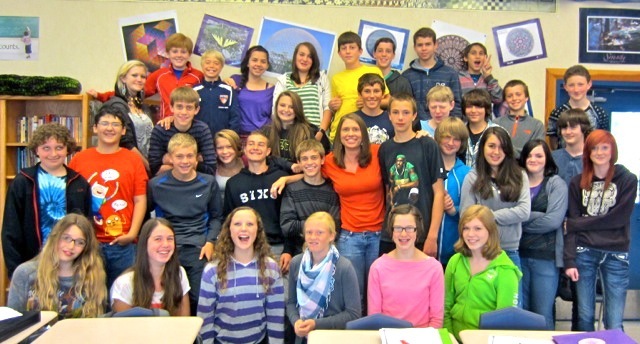 In May 2012 she was the recipient of a Humboldt County Excellence in Teaching Award. 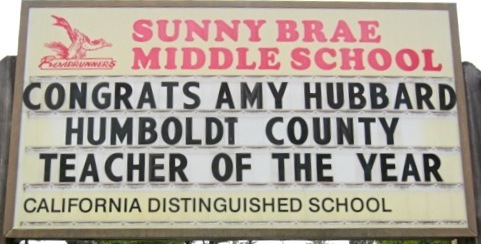 As Humboldt County Teacher of the Year, Hubbard will represent the county as its nominee for 2013 California Teacher of the Year. The California Department of Education is expected to announce its selections for State Teacher of the Year in November. This entry was posted on Friday, September 21st, 2012 at 9:01 am	and is filed under News, Community. You can follow any responses to this entry through the RSS 2.0 feed.